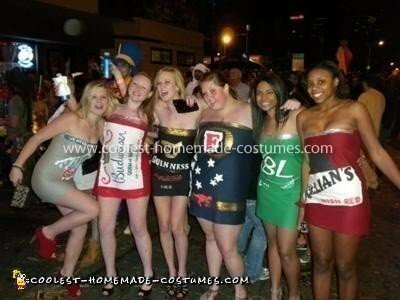 Me and 5 of my close friends wanted to be a 6-pack of beer cans for Halloween, but we couldn’t agree on which beer to be, so we ended up deciding to be a “variety 6-pack”. We were Coors Light, Budweiser, Guinness, Fosters, Bud Light Lime, and Killian’s Irish Red. We sewed tube top dresses out of a T-shirt material fabric and decorated the front with fabric paint. On the back we wrote “enjoy responsibly”. We wore necklaces with pop-tabs and bought matching cans to drink that night. The whole process took about 3 hours per dress, but since we all did our own it wasn’t bad. The total cost of each dress was only $25! 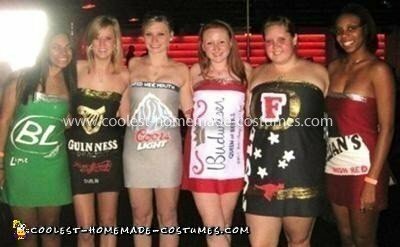 Our Homemade Variety Six-Pack Costume was absolutely a hit! It was comfortable to wear, and really cute for a group of 21 year old girls! A few of us even wore them individually to different parties and they still worked out great! Where did you find the plain tube top dresses!? the coors light one is perfect! !